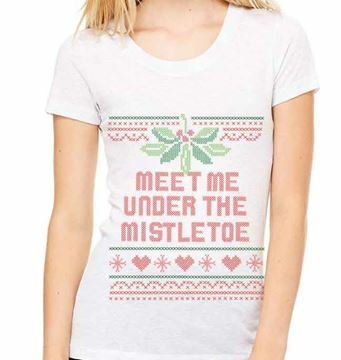 This is the perfect shirt to tell that special someone to rendezvous under that certain holiday plant hanging in the doorway. Ok people.....just make out already! Made from 50% polyester, 25% combed and ringspun cotton and 25% rayon. Straight from the 1992 classic Home Alone: Crazy mobster kingpin Johnny, guns down fellow mobster Acey after a dispute over money, he uses his catch phrase " keep the change ya filthy animal". So to add a festive twist to this catch phase in Angels with filthier souls, the sequal, "Merry Christmas ya filthy animal" was added. Now it will be forever on your T-shirt. Made of 50% polyester, 25% combed ringspun cotton and 25% rayon. Ralphie: I want an Official Red Ryder Carbine-Action Two-Hundred-Shot Range Model Air Rifle! Santa Claus: You'll shoot your eye out, kid. 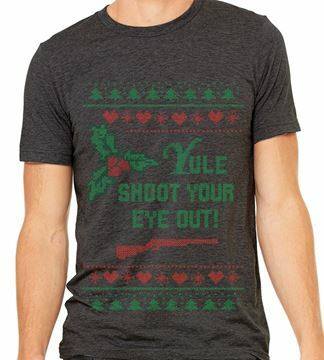 You can have your very own twist on this classic A Christmas Story line. Enjoy...and don't shoot your eye out! Made from 50% polyester, 25% combed and ringspun cotton and 25% rayon.